East Portal, Bergen Hill Tunnel, 2009. Carved stone tablets from the original east portal were reinstalled in the new portal in 1910 (Joseph Elliott). Waldo Yard Tunnel, 2009. The tunnel interior includes original refuge niches (Joseph Elliott). No original drawings or plans of the tunnel have been located. Some records, including the minute books of the Long Dock Company, survive in the holdings of the Pennsylvania State Archives, although much of the same information appears in detail in several published books on the history of the railroad (Mott 1908; Hungerford 1946). Information contained in this website comes from four main sources. Period newspaper articles, principally from the New York Times, provide a number of useful accounts of the tunnel both during and after its construction, as well as general insights regarding the methods and manner of construction. They also offer a glimpse at the relations among the Irish laborers employed at the time. 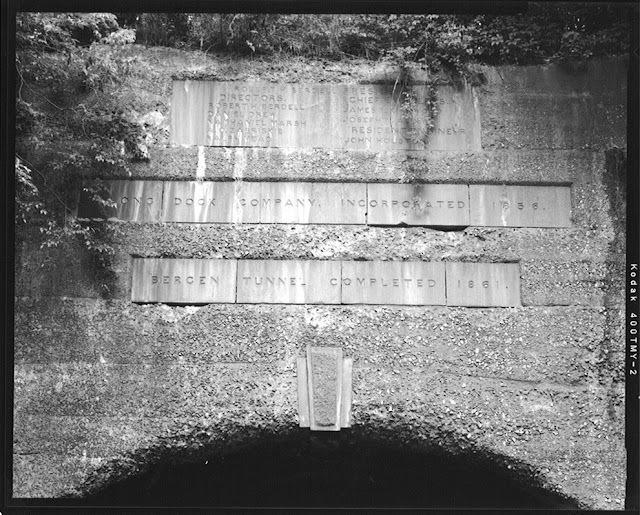 Several published articles from the Transactions of the American Society of Civil Engineers detail the construction of new arches inside the tunnel, as well as useful biographical information about the railroad's engineers. Bruce Seely's Historic American Engineering Record (HAER) report on the Erie Railway prepared in 1977 contains a good general overview of the railroad and elementary information regarding the Bergen Hill Tunnel. It also contains valuable appendices with references and photocopies of many helpful photographs. 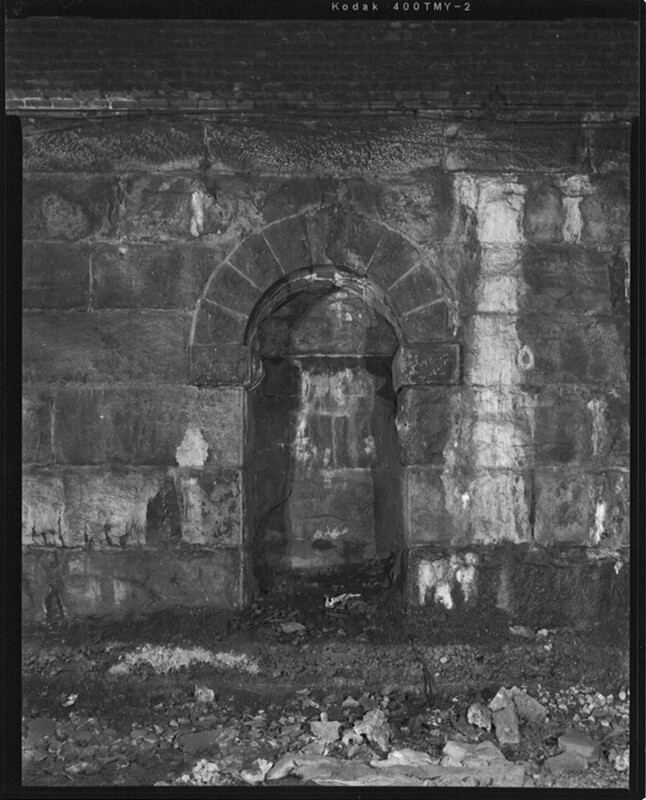 In particular, the reader is directed to photographs of the Erie Railway: Bergen Hill Open Cut, 1906-1910 (HAER NJ-22), which contains useful images of the tunnel's east and west portals prior to their alteration. Finally, the surviving published and manuscript records of two court cases involving the construction of the Bergen Hill Tunnel contain a wealth of information (Beasley 1860; Court of Errors and Appeals 1858; Court of Chancery 1862, 1863, 1866a, 1866b, 1866c, 1866d, 1866e, 1871; Green 1878). The cases include The Long Dock Company v. James H. Mallery and Alfred B. Seymour v. The Long Dock Company. The records of these cases, located in both the New Jersey State Library and the New Jersey State Archives in Trenton, include depositions, inventories, and detailed descriptions of the initial construction. Useful published histories of the railroads involved in the Waldo Yard Tunnel provide numerous facts, illustrations, and insights (Greenberg and Fischer 1997; Harlow 1947; Messer and Roberts 2002). Period newspaper accounts, principally from the New York Times, supply many valuable facts, dates, and accounts of actions on the ground during the conflict over the tunnel's construction. No original construction plans or drawings for the Waldo Tunnel have been located. However, several exhibits used in protracted court proceedings involving the construction of the tunnel include drawings of both the original cut plan and the final tunnel scheme. These drawings, as well as the accounts contained in the court filings, contain a wealth of information about the tunnel and its construction (Dickinson 1895; Freeman 1892; New Jersey Court of Errors and Appeals 1890, 1894, 1895; Vroom 1892). The cases in question include: National Docks and New Jersey Junction Connecting Railway Company v. The Pennsylvania Railroad Company; The State, The United New Jersey Railroad and Canal Company and the Pennsylvania Railroad Company v. The Mayor and Aldermen of Jersey City and the National Docks and New Jersey Junction Connecting Railway Company; and the Pennsylvania Railroad Company v. National Docks & New Jersey Junction Connecting Railway. The records of these cases are located at the New Jersey State Library in Trenton. Useful manuscript records related to the Waldo Tunnel after its construction include the State Board of Assessor's Revaluation field notebooks from 1910-1911, housed at the New Jersey State Archives in Trenton (State Board of Assessors 1910a, 1910b). Finally, the corporate records of the New Jersey Junction Railroad, including docket books, journals, ledgers, board minutes, and maps can be found in the Penn Central Transportation Company's records at the New York Public Library. The following is a detailed bibliography of published and manuscript materials used in the preparation of this website. For a brief overview of the history of railroading in Jersey City, see John T. Cunningham's Railroads in New Jersey (1997). An overall history of the Erie Railroad can be found in Edward Hungerford's Men of Erie (1946). Information on the National Docks Railroad and the Pennsylvania Railroad's presence in Jersey City can be found in Greenberg and Fischer (1997) and Messer and Roberts (2002). Baldwin, Simeon E. (1904) American Railroad Law. Little, Brown, and Company, Boston, Massachusetts. Barber, John W. and Henry Howe (1868) Historical Collections of New Jersey: Past and Present. John W. Barber, New Haven, Connecticut. Beasley, Mercer (1860) Reports of Cases Argued and Determined in The Court of Chancery and an Appeal in the Court of Errors and Appeals of the State of New Jersey. Philips and Boswell, Trenton, New Jersey. Beers, F.W. (1872) State Atlas of New Jersey. Beers, Comstock, and Cline, New York, New York. Burgess, G.H. and M.C. Kennedy (1949) Centennial History of the Pennsylvania Railroad Company, 1846-1946. Pennsylvania Railroad Company, Philadelphia, Pennsylvania. Chanute, Octave (1881) Repairs to Masonry. Transactions of the American Society of Civil Engineers 8(227):291-308. Cook, George H. (1865) Report of G. H. Cook in New Jersey Legislature, Report of the Investigating Committee Relative to The Bergen Tunnel, Made to the Legislature, 1865. J.R. Freese, Trenton, New Jersey. Court of Chancery (1862) Testimony of Edmund Hawkins on part of the Complaintant, Alfred B. Seymour v. The Long Dock Company, p. 269-300, Court of Chancery Dismissed Bundles, Vol. 4, p. 719. On file, New Jersey State Archives, Trenton, New Jersey. ---- (1863) Testimony of Jonathan Camp, Jr., on part of the Complaintant, Alfred B. Seymour v. The Long Dock Company, p. 329-354, Court of Chancery Dismissed Bundles, Vol. 4, p. 719. On file, New Jersey State Archives, Trenton, New Jersey. ---- (1866a) Testimony of John Houston on part of the Defendants, Alfred B. Seymour v. The Long Dock Company, p. 49-193, Court of Chancery Dismissed Bundles, Vol. 4, p. 719. On file, New Jersey State Archives, Trenton, New Jersey. ---- (1866b) Testimony of Patrick Bratton on part of the Defendants, Alfred B. Seymour v. The Long Dock Company, p. 195-232, Court of Chancery Dismissed Bundles, Vol. 4, p. 719. On file, New Jersey State Archives, Trenton, New Jersey. ---- (1866c) Testimony of David B. Martin on part of the Defendants, Alfred B. Seymour v. The Long Dock Company, p. 233-284, Court of Chancery Dismissed Bundles, Vol. 4, p. 719. On file, New Jersey State Archives, Trenton, New Jersey. ---- (1866d) Testimony of James Russell on part of the Defendants, Alfred B. Seymour v. The Long Dock Company, p. 285-314, Court of Chancery Dismissed Bundles, Vol. 4, p. 719. On file, New Jersey State Archives, Trenton, New Jersey. ---- (1866e) Testimony of Patrick Foller on part of the Defendants, Alfred B. Seymour v. The Long Dock Company, p. 315-320, Court of Chancery Dismissed Bundles, Vol. 4, p.719. On file, New Jersey State Archives, Trenton, New Jersey. ---- (1871) Complaintant's Statement of Account Accompanying Master's Report, Alfred B. Seymour v. The Long Dock Company, p. 508-525 and unpaginated attachment, Court of Chancery Dismissed Bundles, Vol. 4, p. 719. On file, New Jersey State Archives, Trenton, New Jersey. Court of Errors and Appeals (1858) Briefs, The Long Dock Company, appellants and James H. Mallery, Charles D. Clark, et al., respondents. Vol. 8, Case 8. Philips & Boswell, Trenton, New Jersey. On file, New Jersey State Library, Trenton, New Jersey. Cunningham, John T. (1997) Railroads in New Jersey: The Formative Years. Afton Publishing Co., Inc., Andover, New Jersey. Dickinson, S. Meredith (1895) Reports of the Cases Decided in The Court of Chancery, The Prerogative Court, and, on Appeal, in The Court of Errors and Appeals, of the State of New Jersey. Vol. 7. The J.L. Murphy Publishing Company, Trenton, New Jersey. Erie Railroad (1956) Erie Railroad Company, Eastern Division, Proposed Single Tracking Freight Tunnel and Elimination of "O-S" Tower, n.d. Railroad Company Annual Reports and Plans, 1937-1975. Department of Treasury, Division of Taxation, Public Utility Tax Bureau. On file, New Jersey State Archives, Trenton, New Jersey. Freeman, A.C. (1892) The American State Reports, Containing the Case of General Value and Authority, Vol. XXVI. Bancroft-Whitney Company, San Francisco, California. Green, Charles Ewing (1878) Reports of Cases Argued and Determined in The Court of Chancery, The Prerogative Court, and, on Appeal, in The Court of Errors and Appeals of the State of New Jersey, Vol. V. William S. Sharp, Trenton, New Jersey. On file, New Jersey State Library, Trenton, New Jersey. Greenberg, William T. Jr. and Robert F. Fischer (1997) The Lehigh Valley Railroad East of Mauch Chunk. The Gingerbread Shop, Martinsville, New Jersey. Harlow, Alvin F. (1947) The Road of the Century: The Story of the New York Central. Creative Age Press, Inc., New York, New York. Houston, John (1868) Arching Bergen Tunnel on the Erie Railroad. American Society of Civil Engineers and Architects Transactions 1(8):75-77. Hungerford, Edward (1946) Men of Erie. Random House, New York, New York. Jersey Journal (1911) Map of Jersey City. Jersey Journal, Jersey City, New Jersey. On file, Rutgers University Special Collections, New Brunswick, New Jersey. Messer, David W. and Charles S. Roberts (2002) Triumph V: Philadelphia to New York, 1830-2002. Barnard, Roberts and Company, Inc., Baltimore, Maryland. Mott, Edward Harold (1908) Between the Ocean and the Lakes: The Story of Erie. Ticker Publishing Co., New York, New York. National Docks & New Jersey Junction Connecting Railway (1898) National Docks & New Jersey Junction Connecting Railway Company Journal, December 31, 1894-May 7, 1898, Lehigh Valley Railroad Company Deposit (MG 274). On file, New Jersey State Archives, Trenton, New Jersey. New Jersey Court of Errors and Appeals (1890) Transcripts, New Jersey Court of Errors and Appeals, on Error, Argument for Plaintiff in Error, Vol. 151, 1890. On file, New Jersey State Library, Trenton, New Jersey. ---- (1894) Transcripts, National Docks and New Jersey Junction Connecting Railway Company v. The Pennsylvania Railroad Company, et al. on Appeal, Vol. 197, 1894. On file, New Jersey State Library, Trenton, New Jersey. ---- (1895) Transcripts, The State, The United New Jersey Railroad and Canal Company and the Pennsylvania Railroad Company v. The Mayor and Aldermen of Jersey City and the National Docks and New Jersey Junction Connecting Railway Company on Certiorari. On Error to the Supreme Court. Vol. 202, 1895. On file, New Jersey State Library, Trenton, New Jersey. New Jersey Junction Railroad (n.d.) Dockets, Journals, Ledgers, Minutes and Maps. Penn Central Transportation Company Records, 1796-1986. On file, New York Public Library, Humanities & Social Sciences Library, Manuscript and Archives Division, New York, New York. New York Times (1856) The Long Dock and the Bergen Tunnel. The New York Times, November 1, 1856:3. ---- (1857) Bergen Tunnel - Construction of Shafts Nos. 2 and 3 - Progress of the Work. The New York Times, July 15, 1857:3. ---- (1861) Opening of the Bergen Tunnel. The New York Times, February 8, 1861:3. ---- (1895a) Gets a Verdict a Second Time: $120,000 [sic] Damages Awarded for Tunneling Under the Pennsylvania R.R. The New York Times, July 27, 1895:6. ---- (1895b) Shovels, Their Weapons: Pennsylvania and Jersey Junction Employes [sic] Fight for a Tunnel. The New York Times, August 28, 1895:8. ---- (1896) A Small, Costly Tunnel. The New York Times, July 5, 1896:17. ---- (1910) Eleven Killed in Erie Tunnel. The New York Times, September 12, 1910:1. New York World (1895a) Fighting for a Tunnel. The New York World, August 28, 1895:8. ---- (1895b) Peace at Point of Rocks. The New York World, August 29, 1895:4. State Board of Assessors (1910a) Pennsylvania Railroad, United New Jersey Railroad and Canal Company (Vol. 13). Records of the 1910-1911 Revaluation of Railroads and Canals in New Jersey. On file, New Jersey State Archives, Trenton, New Jersey. ---- (1910b) Lehigh Valley Railroad, National Docks & New Jersey Junction Branch (Vol. 700). Records of the 1910-1911 Revaluation of Railroads and Canals in New Jersey. On file, New Jersey State Archives, Trenton, New Jersey. Seely, Bruce (1977) The Construction of the Erie Railway System. Historic American Engineering Record (HAER NY-124). On file, Library of Congress, Washington, D.C.
Stanford, Scott D. (2004) Geology [of New Jersey]. In Maxine Lurie and Marc Mappen, eds. Encyclopedia of New Jersey. Rutgers University Press, New Brunswick, New Jersey. Taber, Thomas Townsend (1977) The Delaware, Lackawanna & Western Railroad in the Nineteenth Century, 1828-1899. Steamtown Volunteer Association, Scranton, Pennsylvania. Taber, Thomas Townsend and Thomas Townsend Taber, III (1980) The Delaware, Lackawanna & Western Railroad in the Twentieth Century, 1899-1960. Volume 1. Steamtown Volunteer Association, Scranton, Pennsylvania. Transportation Corporation Files (n.d.) Card Index. Department of State, Secretary of State. On file, New Jersey State Archives, Trenton, New Jersey. Vroom, Garret D. (1892) Reports of Cases Argued and Determined in the Supreme Court and, at Law, in the Court of Errors and Appeals of the State of New Jersey. Vol. 24. The Trenton Electric Printing Company, Trenton, New Jersey. Images and Text Copyright by their creators. For permissions, see the Contact Us tab. Simple theme. Theme images by hfng. Powered by Blogger.